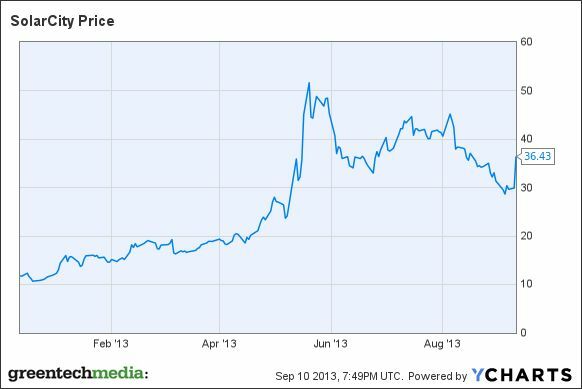 Market responds by sending SolarCity stock up 14 percent. In an era when utilities and the solar industry are locked in an adversarial stance on net energy metering and the true value of distributed generation and PV, SolarCity and an electricity provider are playing nice. SolarCity (SCTY) and energy services provider Direct Energy (a subsidiary of Centrica) have created an investment fund to finance $124 million in commercial and industrial (C&I) solar projects. The fund includes $50 million from Direct Energy, one of the largest retail electricity providers in the U.S. It's Direct Energy's first solar deal, according to the company's blog. 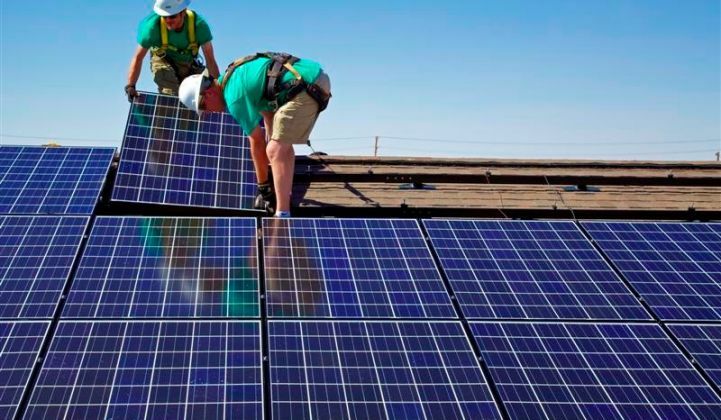 SolarCity notes that this fund gives retail electricity providers a compelling new product and allows Direct Energy to provide a potential reduction to its current utility rates for renewable electricity produced at the site. Some of Direct Energy's C&I customers will be able to install and use solar power with little or no upfront cost. SolarCity is looking for new paths to the solar customer and has been closing multiple funds in multiple channels. The firm's stock has been up today by as much as 14 percent. 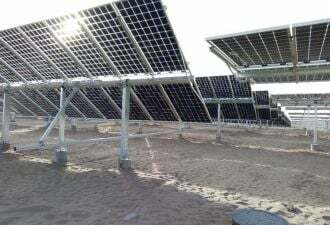 Customers "will be given a choice to prepay for their solar electricity or pay a monthly payment, with installation, insurance, repairs and monitoring service included," according to a release. Direct Energy is North America's largest provider of heating, cooling, plumbing and electrical services, with more than 6 million residential and commercial customers. Why just do this for commercial and not residential? "Our partner, Direct Energy Business, primarily provides service to business customers, that’s why the initial focus is on commercial and industrial customers. This gives Direct Energy a solar energy offering for its customers that can be more affordable than alternatives." Do the customers sign a twenty-year lease as they normally would with SolarCity? Does the lease carry an escalator? "Customers could enter a PPA or lease, and we typically give customers a choice for a flat payment or a payment that starts lower and increases annually." In which states will this be offered? "While there are no geographic limits on the fund, DEB serves customers in California, Texas, Michigan, Illinois, Ohio, Pennsylvania, New York, New Jersey, Rhode Island, Connecticut, Delaware, Maryland, Massachusetts, Vermont and Washington, D.C. We expect much of the initial interest to come from customers in deregulated markets on the East Coast." Will the customers end up seeing a single bill from Direct Energy or two separate bills, one from SolarCity and one from Direct Energy? "Direct Energy is working with SolarCity on a single-bill option." SolarCity recently announced a goal of 1 million solar rooftop customers within five years -- helped in part by the purchase of direct marketing partner, Paramount Solar, for $120 million. The goal is to be at 1 million solar rooftop customers by July 4, 2018. SolarCity currently has 68,000 customers across fourteen states. Installation data presented in this article is drawn from the SEIA/GTM Research U.S. 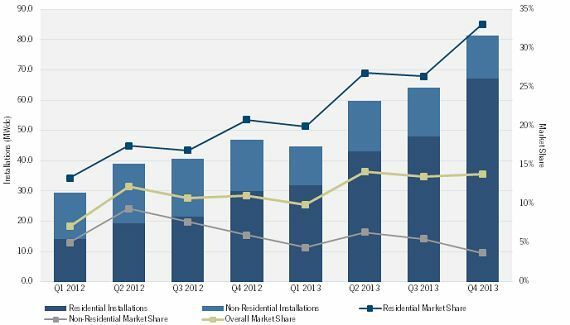 Solar Market Insight report, and company-specific market share data can be found in the U.S. PV Leaderboard.